One can spend days on expedition hoping to see a rare bird species or searching for that elusive mammal only to get a brief glimpse before it flies, hops or slips away into the undergrowth. But when it comes to the smaller and more intricately designed critters, the invertebrate, they are everywhere! You can find them sheltering in most nooks and crevices or can be stumbled upon easily in the vegetation by someone with a keen eye, or in many cases, they will find you first. Let me present to you a few of my most ‘memorable’ invertebrate encounters from the tropics. In these cases I haven’t been surveying for inverts as such, but when you consider that about 80 percent of all described animal species on earth are insects, and at an estimate there are some 10 quintillion (10,000,000,000,000,000,000) individual insects alive on earth at any one time, it’s hardly surprising that I stumbled across a few mini-beast treasures. I had just finished netting dragonflies one afternoon, by a small overgrown pond, and with the nets under one arm I set off up the slope back to base camp. As I had done many times before I felt something crawling on my left hand, so with a quick flick of the wrist I sent this little Latrodectus menavodi flying to the ground. It was only when I looked down that I saw what she was. 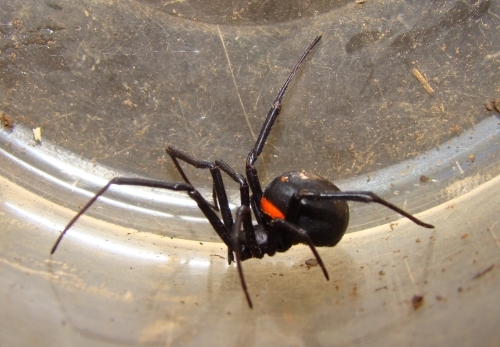 Unlike her American cousins, Latrodectus menavodi’s bite is not deadly but will deliver a neurotoxin that can cause severe pain, nausea and, in some cases, cause a person to go into shock and suffocate. 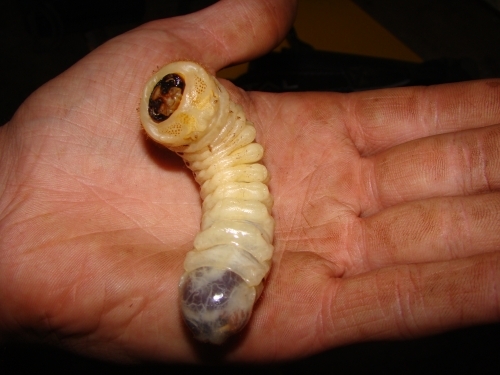 A huge beetle grub belonging to one of the several huge beetle species that inhabit Madagascar. 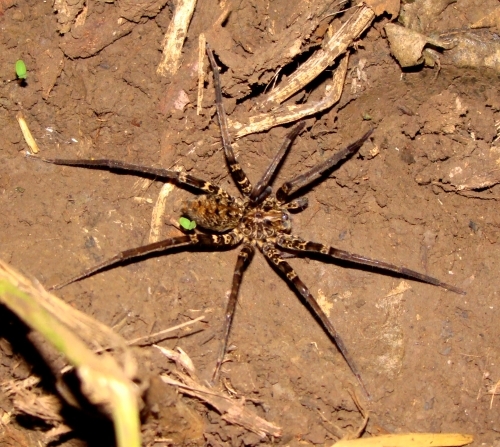 There are 38 known species of Huntsman spider on the Island of Madagascar. They are a mobile spider, actively hunting for insects on the forest floor. Their bite is harmless to humans. They were fairly abundant around base camp but my most memorable encounter was waking up to a rustling sound coming from my pile of belongings just outside my mosquito net. I turned on my head torch and instantly got the eye shine of a large huntsman sat proudly atop my rucksack just inches from my bed. 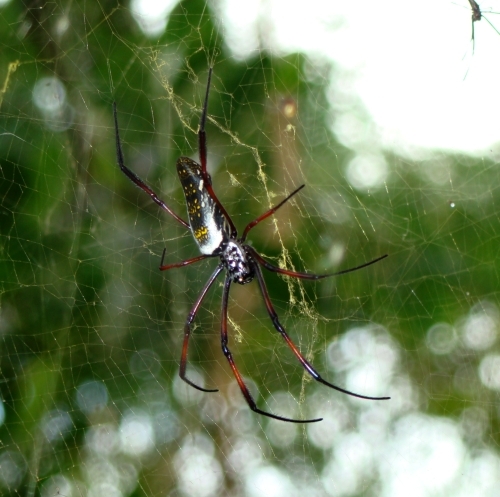 These very large orb spiders Nephila inaurata madagascariensis were highly abundant in the expedition research area in Madagascar. They build huge golden webs which can measure over two metres in diameter and the silk is so strong such that it doesn’t break if you walk in to it. In Madagascar cloth has been made from weaving this spiders silk. This stunning insect was basking on my day bag in the afternoon sun. This is easily the biggest praying mantid I have seen. 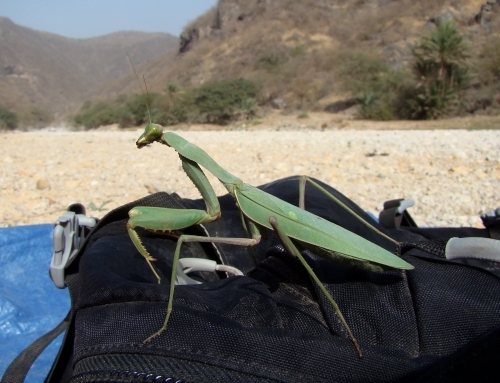 This bizarre insect was spotted in the base of Wadi Sayq. 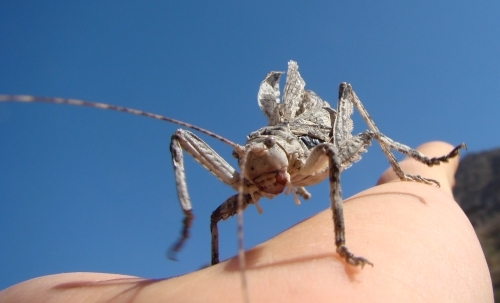 I have no idea what it is, perhaps a strange locust species? If anyone can shed any light on the identity of this individual please let me know in the comments box below. Scorpions are common throughout the globe. 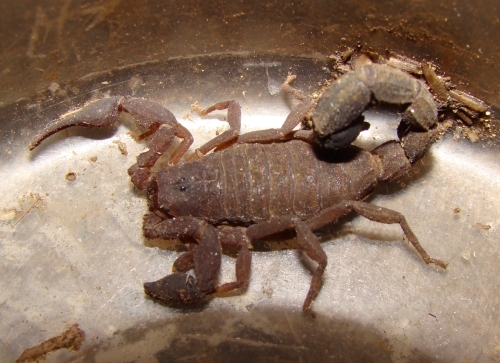 The scorpions that the expedition encountered in Oman’s Empty Quarter would seek shelter under rucksacks and inflatable mattresses to avoid the cold night-time temperatures. I almost stepped on this creature. 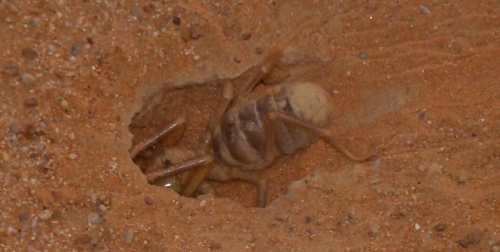 It was only when Emma Docherty shouted ‘watch out’ that I spotted this camel spider digging a hole in the sand. Foolishly I was not wearing any shoes as the cool evening sand felt great on my tired feet, so thank you for the warning, Emma. They are bizarre creatures, classified as Solifugids; taxonomically they lie somewhere between a spider and a scorpion, probably branching off and evolving independently. These creatures have gained vast publicity on the internet with many urban legends arising from the Gulf War. Solifugae derives from Latin, and means ‘those that flee from the sun’; indeed, camel spiders are shade-seeking animals and their innocent behaviour when seeking shade in a human shadow has been misunderstood as a threat towards humans. Their bite is not deadly, nor toxic, but is painful and can become infected quickly. 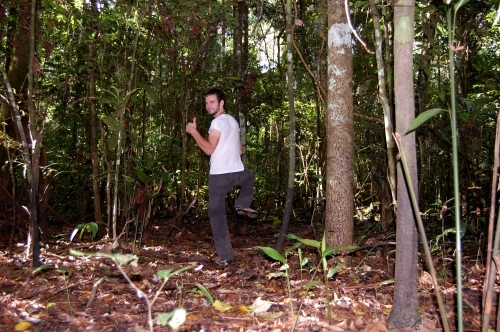 It was our first walk into the tropical Amazonian forests, I had dreamed of this since I was a boy. Minutes later I was in my element apart from one tiny irritating factor – there was something buzzing very loudly above my head yet despite constant hand-wafting and ducking around like a pansy I couldn’t for the life of me see what or where this irritating insect was. Running my hands through my hair I felt something buzzing on the palm of my hand, instantly I leant over and fluffed up my hair to get the creature out. But the buzzing continued. I then found the insect in question firmly attached to my scalp along with a few of his friends. After plucking several from my head, my guide explained that these were sweat bees which had crawled in to my hair attracted to a meal of salty sweat. Yum. They do not sting but emit an annoying loud buzz when feeding. In some cases, close encounters with inverts go unnoticed. 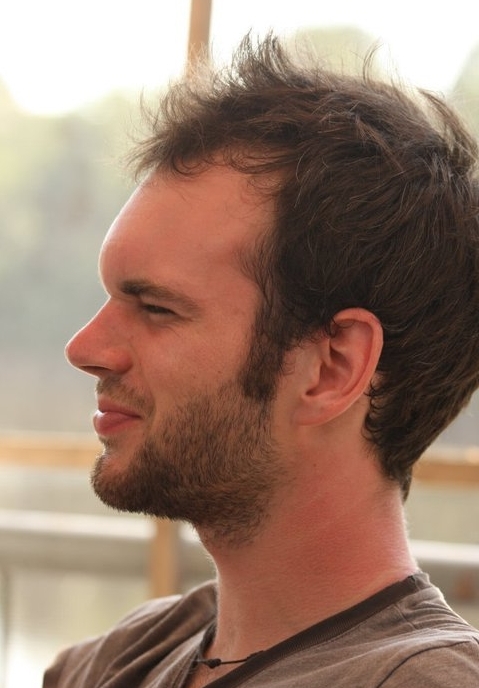 I didn’t see the creature that gave me this bite on my forehead in the Amazon. My guess is a spider that was in the wrong place at the wrong time. Or was that me?! And it doesn’t stop there. I have stumbled upon giant centipedes and millipedes, bizarre hairy caterpillars, slithering flatworms, mole crickets, huge wasps and hornets, weird and wonderful weevils, bright red and yellow hissing cockroaches, island gigantism pill millipedes, and of course my favourites; the stunning dragonflies and damselflies – all seen by chance in the field, most examined in the hand, and all hugely fascinating.